Opening a bottle of Champagne is always something to celebrate but watching a bottle being open with a sword is something else!!! The ‘sabre’ technique involves chilling the top of the bottle of Champagne, removing ALL the foil and the wire cage (very important to have really chilled the bottle and to keep the bottle away from anything breakable or people! ), holding the bottle at a 45° angle away from the body (and people), before running the sabre in a quick strong motion up the neck of the bottle. Fuelled by the pressure in the bottle as well as the momentum of the sabre, the force of the blade hitting the lip of the bottle breaks the glass separating the collar and cork from the neck of the bottle. The cork and collar remain together and typically travel about 5-10 metres! 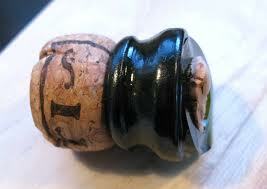 A good sommelier can sabre open a bottle with very little loss of Champagne. The art of sabrage should only ever be carried out on Champagne or other sparkling wines that have been made by the Traditional Method e.g. Cava. The bottle thickness and strength due to the pressure, around 6 atmospheres, is not the same for other sparkling wines or in fact still wines made by other methods. 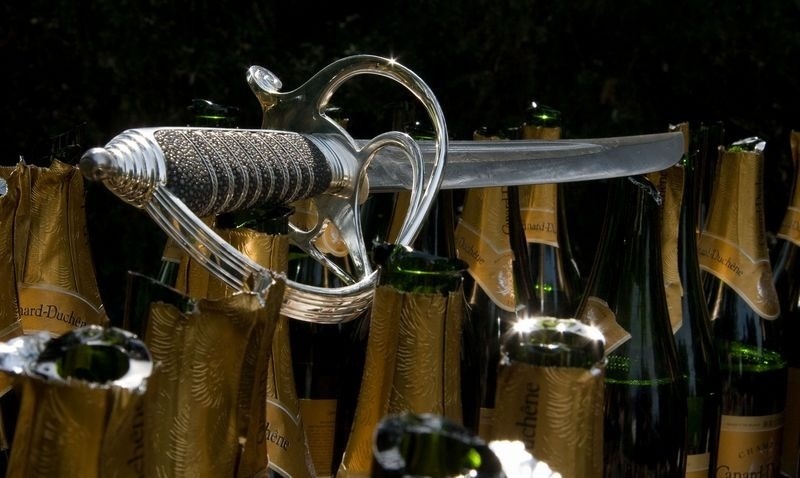 Today, you can buy Champagne Swords specially made for sabrage from around £100 upwards. They all feature blunt blades so if you use a kitchen knife, the blunt side would need to be used! For a mere £24,500.00, you can buy a hand forged Champagne Sabre from luxury designer Henry Tuke! Their Tuke Damascus steel sabre, with sold sterling silver guard, a shagreen grip and pure silver wire detailing, which sits on a makarta and ancient 2000 year old Roman oak stand, does look particularly beautiful! In 2011, Tom Tuke-Hastings, founder of Henry Tuke, broke the Guiness World Record for speed sabering 35 bottles of Canard Duchêne Champagne in ONE MINUTE (previous world record stood at 27) without putting a single scratch on the blade!! Happy sabrage, but be warned it can be dangerous!